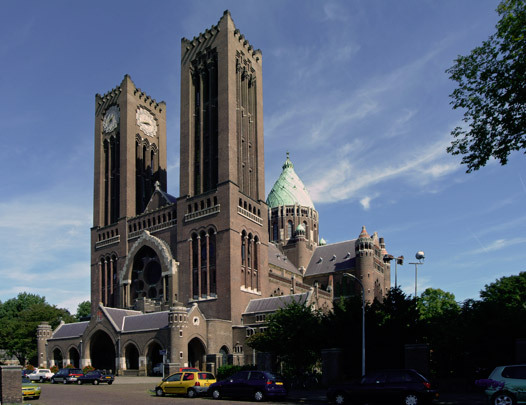 The old St Bavo church in the centre of Haarlem had been confiscated by the protestants in 1578. As the 20th century dawned, a majestic new Catholic cathedral took shape at what was then the edge of town. As the presbytery necessarily faces east, the cathedral's position is slightly unfortunate. The church has a cruciform three-bay plan with side chapels and radiating chapels round the choir. The two towers were added much later in 1930 and were kept simple so as not to steal the copper crossing dome's thunder. Neo-gothic motifs are joined by early Christian, Romanesque and even Art Nouveau forms. The riot of artworks elevates the church to a true Gesamtkunstwerk.